PORTLAND — After spending the past two months basking in endless praise, thoughtful gifts and nostalgic video tributes, Kobe Bryant experienced something that seemed more natural during his accomplished and drama-filled NBA career. 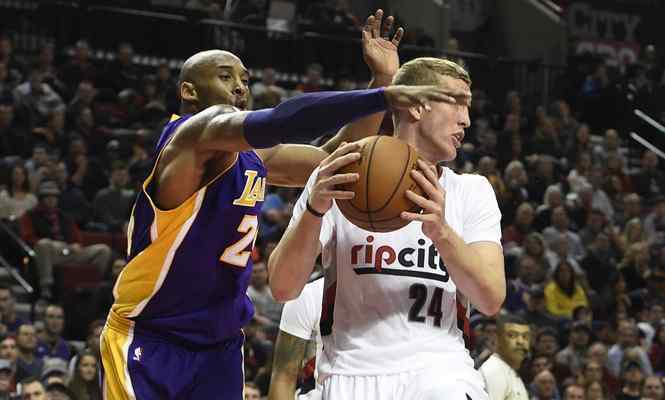 Bryant became the villain again during the Lakers’ 121-103 loss to the Portland Trail Blazers on Saturday at Moda Center. The examples went beyond the hometown crowd booing him every time he touched the ball. With the Lakers offering little to stop Portland’s Damian Lillard (36 points) and CJ McCollum (28 points), Bryant provided pointed comments to his teammates about their play in the locker room afterwards, according to multiple sources familiar with the situation. Bryant, who posted 10 points on 5-of-9 shooting and five turnovers in 25 minutes through three quarters, became upset both with the Lakers (9-37) for losing their sixth consecutive game and for some on the team smiling after the loss, sources said. Bryant took particular aim at Lakers rookie point guard D’Angelo Russell and second-year forward Julius Randle and even called them out by name, sources said. “You know I don’t do the gossip [expletive],” Bryant said in a friendly exchange when asked about the incident. None of Bryant’s teammmates, including Russell and Randle, were specifically asked about Bryant’s criticisms because Los Angeles News Group learned the revelations after media access to the locker room ended. But multiple sources confirmed that Bryant spoke for about two minutes after Lakers coach Byron Scott addressed the team. Bryant also expressed his displeasure during a timeout when the Lakers trailed, 93-74, with 1:57 left in the third quarter. That happened after Randle missed two consecutive rebounds before Lillard hit a 3-pointer. The Lakers looked deflated after the play. “We just weren’t defending,” Randle said about Bryant’s criticisms during the timeout. Scott elaborated more, saying his players did not follow his game plan in trying to keep the ball away from Lillard and McCollom by double teaming them. But Scott expressed hope that message would become better ingrained with Bryant echoing his critiques. The Lakers still boasted a balanced offense featuring Russell (21 points), Lou Williams (16), Randle (11 points, nine rebounds) and Jordan Clarkson (10). But Russell considered his offensive contributions “irrelevant” since he scored nine of those points in the fourth quarter when the game was out of reach. Scott only called Russell’s play” okay” before sitting him for the final 7:27 with the game out of reach. Clarkson appeared annoyed and sounded frustrated with the team’s defense. Before Bryant expressed his dissatisfaction to his teammates, the Blazers fans did not sound welcoming either. Once he heard his name announced in the starting lineup, Bryant mostly heard boos. Any time he touched the ball, Bryant heard the same thing. Instead of the Blazers offering a video tribute of Bryant’s greatness, Portland showed a highlight reel of its two previous victories against the Lakers this season by an average of 13 points. Cheers only erupted during two instances. Legions of Bryant supporters pleaded for Bryant to play in the final minutes. Although several fans chanted “Kobe, Kobe” at times throughout the game, some Blazers fans jeered his presence. One fan even held a sign that said, “Kobe, we will miss beating you!” Bryant heard something even more amusing. Bryant offered little retort on the court, though Scott praised his star player for adopting a less-is-more approach. Still, Bryant ended his 20-year NBA career with a 6-26 record in Portland. Yet, that did not stop Bryant from averaging 27.6 points against the Blazers, his highest career total against a single team. That included Bryant posting 47 points on 14 of 27 shooting, eight rebounds, five assists and four blocks on April 10, 2013 to help the underachieving and injury-laden Lakers secure a playoff spot. During that stretch, Bryant had averaged 28 points in 45.6 minutes per game in the last six contests before tearing his left Achilles tendon on April 12, 2013 against Golden State. Bryant also played a role in disrupting Portland’s postseasons in 1997 (four games in the first round), 1998 (four games in the first round), 2000 (seven games in the Western Conference Finals), 2001 (three games in the first round) and 2002 (three games in the first round). Bryant’s favorite memory happened in Game 3 of the 2000 Western Conference Finals when he blocked Portland center Arvydas Sabonis before the buzzer sounded to secure the win. But Bryant’s biggest moment happened in Game 7 of the 2000 Western Conference Finals. Then, Bryant posted 25 points, 11 rebounds, seven assists, four blocks and a signature alley-oop from Shaquille O’Neal in the final minute. And that also explained Bryant’s heated talk with his teammates afterwards. Though the Lakers field an unproven and inexperienced roster, Bryant expected more out of this group with both results, effort and attitude. Byron Scott is a substandard NBA coach. Lakers have no big talents with Kobe still living in a fantasyland.